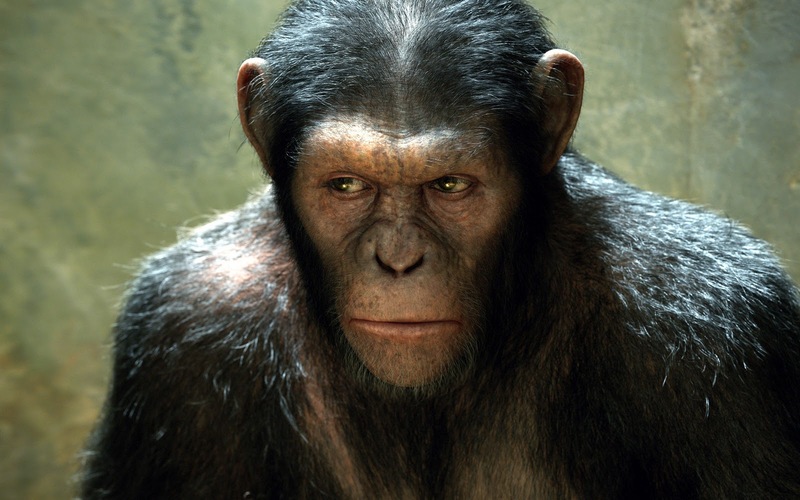 Movie Ramble: Rise of The Planet of The Apes. The original Planet of The Apes was released in 1968 and told the story of how a space ship crash-landed on a strange planet in the distant future. 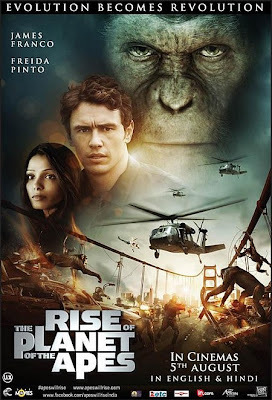 The planet appeared at first to be uninhabited but the three surviving crewmembers stumble upon a society in which apes had evolved into intelligent creatures. These human like apes are now the dominant species with the original humans dressed in animal skins and mute! This story was based on a 1963 French novel La Planete des Singes by Pierre Boulle and the movie was directed by Tokyo born Franklin J Schaffner whose oeuvre includes Patton (1970) and The Boys From Brazil (1978). The main recognisable face in this original movie was the gun loving Charlton Heston who was mainly known for appearances in historical epics like Ben-Hur (1959) and The Ten Commandments (1956). After re watching this film I can’t imagine why it’s ranked as a “classic”? 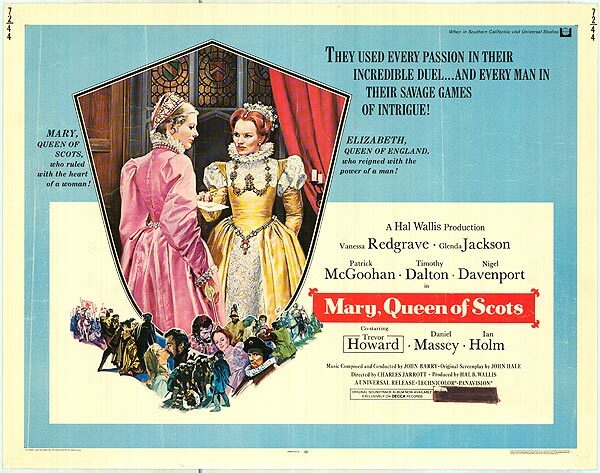 It has a slow plodding story line that seems to take for ever to get to the point, its completely devoid of excitement in fact it’s tedious, the budget appears non existent and as for Heston himself, a wooded post would have more personality and come to think of it have more acting prowess. Four more films followed in this particular franchise and judging by the trailers were worse than the initial film. 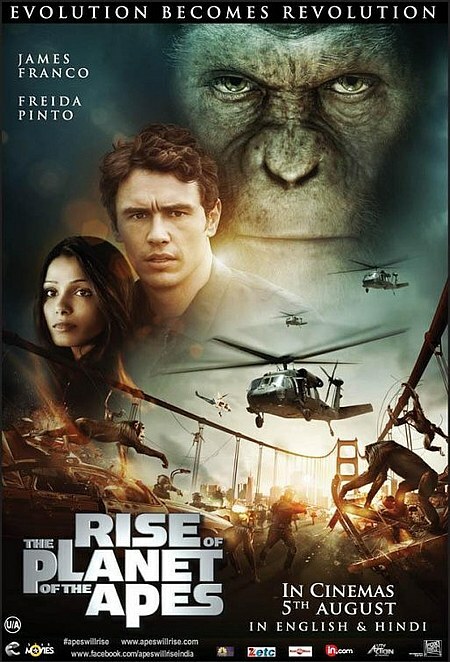 They have now rebooted the franchise with the recent release of a prequel Rise of The Planet of The Apes (2011). Directed by the 38 year old British born American resident Rupert Wyatt whose previous film was his debut Escapist (2008) it starred Brian Cox who played a convict 12 years into a life sentence with no hope of parole. He develops an ingenious escape plan to allow him to regain contact with his estranged daughter who has fallen ill, recruiting a desperate band of fellow prisoners to help in his endeavours. 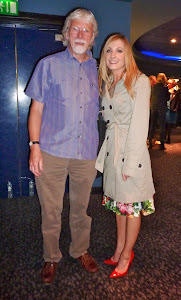 That film had a brilliant structure and a clever narrative. Wyatt’s new film challenges the reason for the downfall of mankind intimated in the original 1968 version. This time it’s not an arms race that places the apes in the ascendancy but mankind’s quest to discover a drug to cure Alzheimer’s. 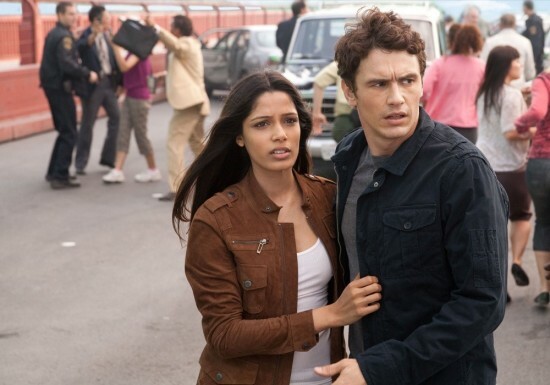 Scientist Will Rodman (James Franco) develops a gene-therapy drug to repair the human brain. His main guinea pig is an ape called Bright Eyes and when she runs amok every one assumes it’s the effects of the drugs and the trials are cancelled. Rodman soon discovers that Bright Eyes is pregnant and that she was only protecting her newly born child. He then proceeds to take the infant home and names him Caesar. As the youngster grows up he begins to show a high intelligence level and this is when our story really begins. 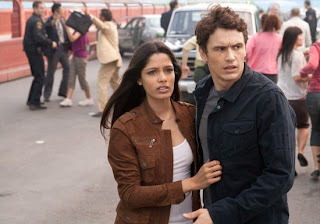 Freida Pinto and James Franco. Using modern technology known as performance or motion capture which refers to recording actions of human actors, and using that information to animate digital characters meant that Andy Serkis could play Caesar without resorting to an hairy ape costume. The same technology allowed him to play King Kong (2005) and Gollum in the Lord of The Rings Franchise. What a difference 43 years makes? 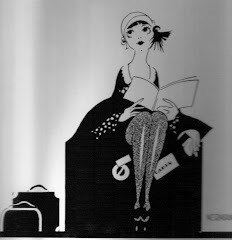 We now have an example of first class escapist entertainment with never a dull moment. The movie’s just the right length, has some decent acting from our two main stars also from Freida Pinto and Brian Cox, obviously a sizable budget and a very engaging storyline. 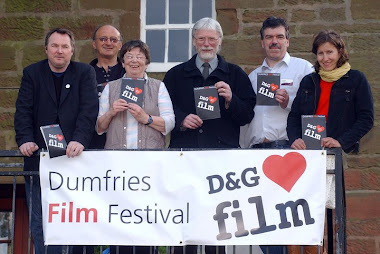 It may be too late to see it at your local cinema but I imagine it we be available on DVD fairly soon.